Korea Central News Agency — essentially the North Korean equivalent to Xinhua, minus all the foreign bureaus — was full of news this past week of commemorations of April 15, Kim Il Sung’s birthday, the so-called “Day of the Sun.” Of these stories, I found this dispatch to be the most strange: A Chinese delegation, it appears, crossed the border at Hyesan and made their way west along the Yalu to reach Ponchonbo, the site of a 1937 battle between Kim Il Sung and some Japanese border guards, in order to “pay tribute” to Kim Il Sung’s world-shattering action. Did this visit really happen? If so, which Chinese were these? What did they think of all the little towns on the North Korean side? And what did the locals think of the outsiders? The real source of discomfort is that the predominance of real “revolutionary sites” for North Korean history lie in China itself. 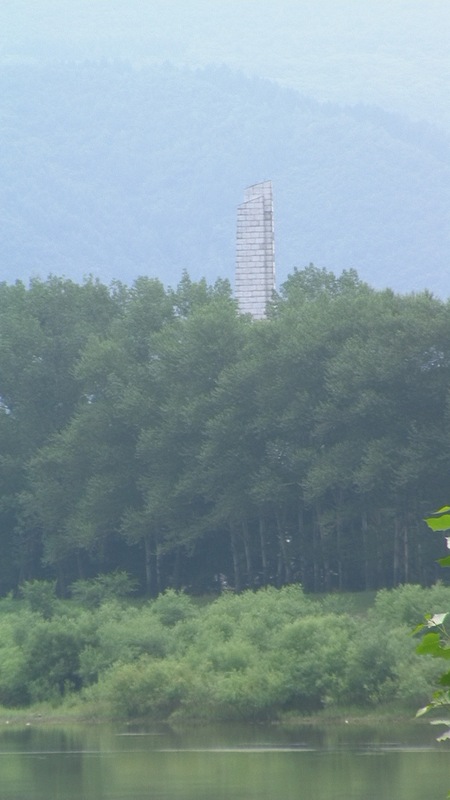 When was the last time any North Korean cadre made a pilgrimage into the Northeast to seek out the old stocky towers commemorating cooperation between Korean and Chinese communists on the run against Japanese “anti-bandit” squads? The real unused opportunity for revolutionary tourism is in China, people! On the broader geo-political front, Chinese Premier Wen Jiabao may be garnering praise and attention for his editorial on Hu Yaobang, but Wen has also been busy recently in coordinating certain aspects of China’s North Korea policy. He met last week with the outgoing DPRK Ambassador, Choe Jin Su, as recounted by KCNA, stated: “Visiting the DPRK last year, I saw for myself the great successes made by it in socialist construction despite difficulties.” KCNA further paraphrased the Premier, stating that he expressed “sincere hope that the Korean people would develop economy and improve the people’s standard of living to build a rich and powerful country.” Similar sentiments, though with a bit less prodding for the DPRK to liberalize its economy, were voiced at a party hosted by the DPRK embassy in Beijing. Meanwhile, Chinese tourism ministry officials like Zhu Shanzhong, along with PRC’s ambassador to the DPRK, Liu Hongcai, are meeting in Pyongyang to discuss more Chinese tours to the country. I wonder if Chinese tour groups mind that their obligatory visits to the immense statue of Kimg Il Sung are subsequently used as domestic propaganda by Pyongyang. And I do believe that we now know a few of the recipients of those Chinese cars Kim Jong Il was importing last week. Kim Jong Il sends his greetings to Syria. Pyongyang, April 14 (KCNA) — The newly-built E-Library at Kim Il Sung University was completed. It has several reading halls, information service hall, computer-aided education room, remote-controlled lecture room, multimedia room, general lecture room, academic exchange room, IT research room, etc. equipped with various kinds of the latest electronic devices. The construction of the E-library made it possible for the university to play a role as a central seat for remote-controlled education of social and basic sciences and information service to all parts of the country. A ceremony for the completion of the library took place on Wednesday. Present there were Kim Yong Nam, Kim Yong Il, Choe Thae Bok, Kim Ki Nam, Choe Yong Rim, officials concerned and teachers, employees and students of the university and soldier-builders. A report for the completion was made by Kim Yong Nam, president of the Presidium of the Supreme People’s Assembly who is member of the Political Bureau of the Central Committee of the Workers’ Party of Korea. The soldier-builders worked the miracle of completing the construction of the modern E-library in a matter of nine months, with a single desire to successfully translate into reality the noble intention of General Secretary Kim Jong Il who is working hard to present best things to the rising generation, he said. Recalling that Kim Jong Il sent to the library his autographic propositions “Let’s look at the world with firm foothold on our own land! Prepare to be reliable pillars of the Songun revolution equipped with noble spirit and rich knowledge! Make redoubled efforts to make the world look up to the great party and Kim Il Sung’s Korea!” he stressed the need for the students to thoroughly carry them out, regarding them as motto of life and struggle. The participants looked round the library.